October 16, 2015 – DKI, North America’s largest disaster restoration contracting organization, today announced that one of its member companies, Cousino Harris Disaster Kleenup of Ohio and Michigan, is running their fifth annual “Play it Forward” used toy drive on October 23-24, 2015. The Play it Forward toy drive collects gently used toys, books, games, puzzles, bicycles, stuffed animals, wagons, etc. for underprivileged children. Toys are sorted by age group and category, then washed and properly cleaned to remove any bacteria. 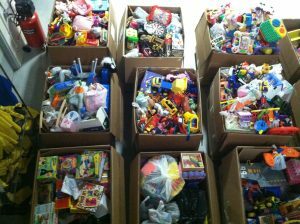 Over the years, the toys have been delivered in a variety of ways, including dropping off at shelters and giveaway events at the Wayman Palmer YMCA and Erie Street Market. This year, organizations will be invited to Cousino Harris’ main location to “shop” for toys that can be used at their facilities or distributed amongst the families. Play it Forward would not be possible without the incredible support of the Perrysburg’s DECA Program’s marketing students, Penta Career Center’s Job Training Department students, Bowling Green State University’s sororities, Perrysburg High School’s Honor Society, Batteries Plus, several retired Knights of Columbus, and many more who contribute their time and donations. Donations of used toys and batteries can be delivered on October 23 from 10:00 am to 4:00 pm and October 24 from 9:00 am to 3:00 pm at Cousino Harris’ main office located at 26901 Eckel Road, Perrysburg, OH. The date of the giveaway will be determined based on completion of sanitation and cleaning. If you have questions about the event, please contact Shelly Konz at 419-931-2054. With a full service team of skilled craftsmen and technicians, Cousino Harris Disaster Kleenup is equipped to tackle any size reconstruction and/or remodeling project, whether residential, commercial or institutional. Cousino Harris Disaster Kleenup is proud to be able to be involved with projects from beginning to end. For information please visit us at www.cousinoharris.com or call 419-874-9500.